The GSP-827 Spectrum Analyzer is a very handy instrument for RF measurement application, delivering a superior combination of easy-to-use design and exceptional price/performance value enclosed within a highly portable package. Covering 9kHz to 2.7GHz, the GSP-827 is designed to meet Production/Development test demands of RF products as well as on-site Maintenance/ Installation of wireless communication systems. Covering a frequency range of 9kHz ~ 2.7GHz, the GSP-827 is designed to meet demands in production or development testing of RF products, maintenance or installation of on-site wireless communication systems. The exceptional price/performance, high portability, and easy-to-use design make GSP-827 a very accurate and convenient instrument for most RF measurement applications. With the AC/DC/Battery power operation, a light 4.5kg weight, compact size, and coverage from 9kHz to 2.7GHz, the GSP-827 is a very convenient tool for field servicing RF systems. 100 sets of memory for saving 100 traces or setups make repetitive measurements and mass storage of test results possible. The large memory size of the GSP-827 is also a useful feature for characteristic verification of products and components. Repetitive measurement results can be saved internally, and then transferred to a PC for further analysis. Utilizing advanced synthesizer-based design, the GSP-827 delivers accurate and reliable measurements. The remarkable performance of -100dBm average noise floor and -100dBm ~ 20dBm wide input range greatly expands the product application range. The ACPR, OCBW and CH power measurements make the verification of wireless communication characteristics simple and easy. The Split-Window display simultaneously shows waveform spectrums in two separate frequency spans. Setups make complicated measurements a simple task. The optional built-in tracking generator with normalized output allows easy performance testing of RF components and modules. All these innovative features reflect the price/performance value of the GSP-827. The GSP-827 provides versatile capabilities to measure Channel Power (CHP), Occupied Bandwidth (OCBW) and Adjacent Channel Power Ratio (ACPR). These capabilities are essential to verify transmission characteristics of wireless communication systems. By setting the channel center frequency and channel bandwidth, the GSP-827 automatically measures the total transmitted power within the bandwidth of the specified channel. By setting the channel center frequency and the total percentage of transmitted power, the GSP-827 automatically indicates the bandwidth that represents the percentage of the total amount of transmitted power. adjacent channels either within the same communication system or among different communication systems. The GSP-827 allows operating flexibility under both Delta-Marker mode and Multi-Marker mode. Up to 10 markers can be selected to show their absolute frequency and amplitude in a table on the screen. The relative frequency and amplitude of the selected markers-to-reference marker can be shown quite easily. All Markers provide fast and comprehensive interpretations of measurements and full marking capabilities including, Peak Search, Marker to Center, and Peak Track. The GSP-827 provides up to 100 sets of memory to save or recall waveform and measurement set-ups. A specified file name and date/time stamp can be attached to each saved file for easy recognization of all saved information. With a large memory size, the GSP-827 facilitates measuring on site service and product characteristic verification. Upper and lower limit lines can be easily set to monitor abnormal signals under user defined conditions. Each Limit Line can be set by linking points positioned by frequency and amplitude data. The Split-Window function allows you to view the frequency spectrum of an input signal on two separate screen areas under two different settings. 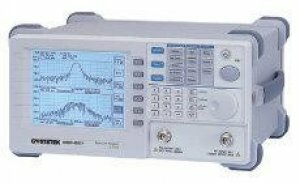 The split window function provides the value of two spectrum analyzers in one instrument. With the optional Tracking Generator, the GSP-827 becomes a convenient tool to verify characteristics of dual-port components such as filters and amplifiers. The normalization process of the output signal compensates the uneven signal loss caused by side effects from measurement cables and connectors to ensure an accurate measurement. The GSP-827 is complimented with free PC software (EagleShot) to easily transfer acquired trace and the associated data from the GSP-827 to a PC through the RS-232C interface. With the carrying case, the GSP-827 makes on-site RF measurements more convenient than ever. The carrying case not only provides protection and portability for the GSP-827 but also carries test accessories such as RF cables, antennas, and a battery to facilitate measurements. Functions: peak hold, average, freeze, math. NOTE : 1. (*)Only one option could be selected among option 12 to 16 for any given GSP-827 unit 2. All options are factory-installed.